Macquarie Island lies in the Southern Ocean, between Antarctica and New Zealand. A speck of green in the vast, windswept sea, it is a haven for many creatures that live above and below the waves. 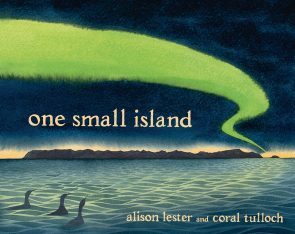 In One Small Island, Alison Lester and Coral Tulloch bring us the story of this remote and precious World Heritage Site. Together they explore the island’s unique geological beginnings, discovery and degradation at the hands of humans, and the battle to restore it today. This beautifully presented book leaves us with an important question: can Macquarie Island and places like it be saved? Alison Lester is one of Australia’s most popular and bestselling creators of children’s books. She has won many awards, including the 2005 Children’s Book Council of Australia (CBCA) Picture Book of the Year Award for Are We There Yet? and the 2012 CBCA Eve Pownall Book of the Year Award for One Small Island. Her most recent picture books include Running With the Horses, a story based on the evacuation of the world-famous Lipizzaner horses from the Spanish Riding School in Vienna during the second world war; One Small Island, about the life and times of a World Heritage Listed island; Sophie Scott Goes South about a little girl’s voyage to Antarctica; and Kissed by the Moon, a lyrical lullaby for small babies celebrating a child’s wonder at the natural world. Coral Tulloch has illustrated over 50 fiction and non-fiction books for children, in Australia and internationally. She is the creator of a syndicated page for children, ‘The Tales of Wombat Creek’, which appeared for over 20 years in newspapers throughout Australia and overseas. Her book Antarctica, The Heart of the World, which she wrote and illustrated, won the Environment Award for Children’s Literature in 2004. As well as having a passion for environmental education, Coral loves Antarctica, which she visits when she can as artist-in-residence on tourist voyages; but recently drawings of penguins have given way to tortoise shells. Coral lives in Hobart with her husband, Peter and daughter, Tully.